The people that are lucky enough to run around with iPhones in their pockets probably wonder what to do with their old phones. Here is a suggestion. Regular readers will know that I like photographic experiments. So first, the ones that just retired their Nokia N95. It has built in time lapse photography. Something called “sequence mode”. Simply choose what kind of sequence you want, click the trigger and let the camera snap an image at the selected interval. 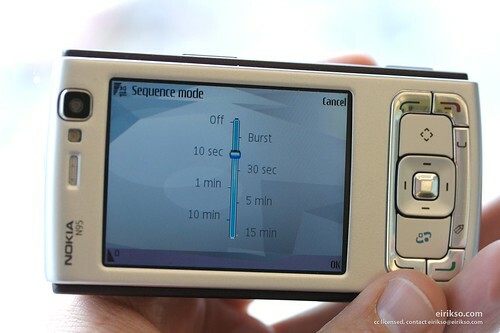 I did an experiment and placed my N95 in the window of my car while out driving. It happily snapped an image every 10th second. Giving a stop motion movie of my short ride. Very short and very useless. The problem with proper time lapse photography is the fact that it takes time. I am not the happy owner of an iPhone, so I can’t just place my N95 in a window for a couple of weeks. So I decided to put my old and trusted Nokia 6630 into duty. You know, the phone that survived the 20 meter drop. It has no proper time lapse function built in. A little searching around the net and I found a solution. One involving a Java application and one involving a Python script. I decided to try the last one. 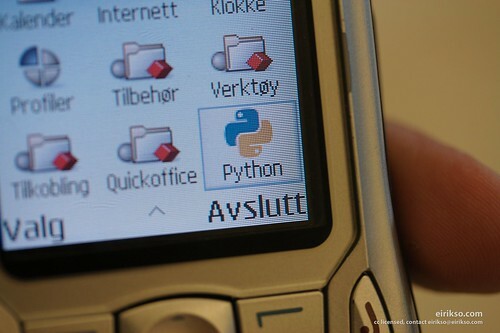 You find some help installing Python on your phone here. Before you install it on your phone you need to remove the “.txt”-extension and replace it so the file name ends with “.py” and only “.py”. 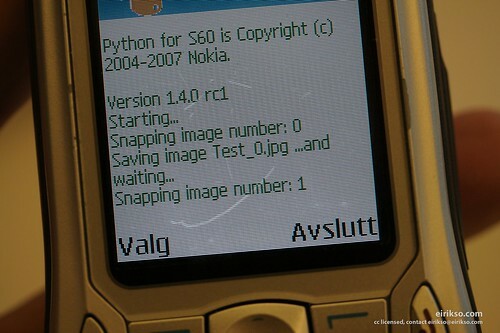 In other words, the file you send to your phone should be named “6630Timelapse.py”. Your images will be stored there. 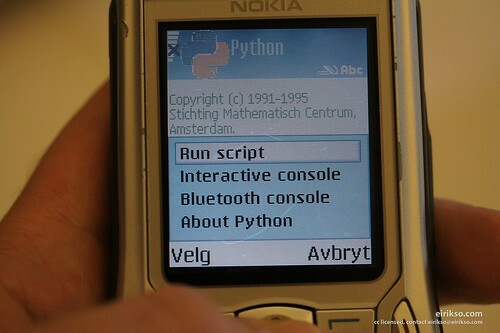 Then you start Python and select “Run Script” from the menu. Give the project a name, decide a number of images and an interval. Note about the interval, choosing anything less than 5 seconds might cause problems. 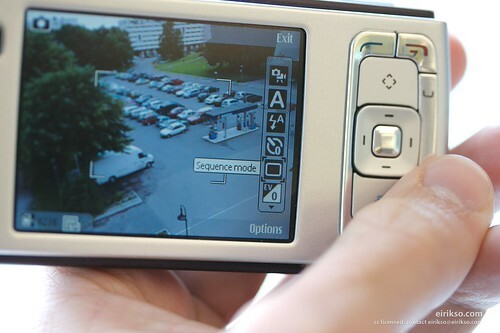 The phone needs some time to store the image on the memory card. Time to test it. I simply put it outside our window facing the sky. Snapping an image every 15th second during the evening until the sky went dark. My experiments indicates that the phone can snap about 500 or 600 images on one charge. Of course depending on the time interval. If you connect a charger you could leave it until the memory card is full. And here’s another one. A couple of hours outside the window at work. I’ll bring that phone when travelling. Leave it in my hotel room to document the cleaning process. Leave it on stage while speaking, to document how many people left during my presentation… Endless possibilities. Any tips for software that can help me take time lapse photos with my digital camera? I have a pretty simple, but ok camera, but it does not have time lapse a function! And just one more thing! How do you ad Flickr to your site. What code and where to put it? Thanx! Cool! Please post links here if you make some videos with this system. i have a litte problem, if the cell screen saver start, Python crash, maybe due out of memory problem. 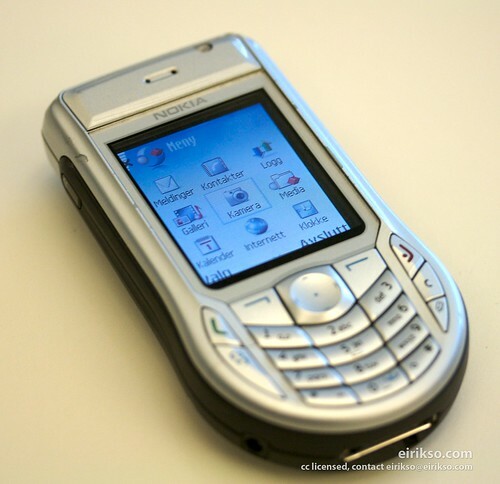 Hello all,Can let please how to buy the old Nokia mobile phone?